We have to admit that our obsession with tattoos is a never-ending thing, because *nothing* is cooler than a permanent accessory in the form of super beautiful, super unique body art. For those among us who like a simple, clean, tattoo, though, tattoos with a clean border are for sure the way to go. So when we came across these KILLER circle tattoos, we were immediately like, heart-eyes on 100,000,000. Because, seriously, these are so, so good. 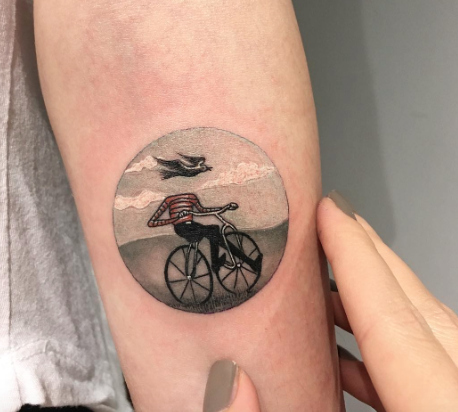 Meet Eva Galipdede, a tattoo artist based in Galata, Istanbul. Eva creates just the work that you need to add a bit of art to your body. Between her adorable woodland creatures to her absolutely stunning scenes of the ~world beyond our laptops~ we *cannot* get enough. With her clean, clean lines and penchant for everything tiny (and talent for making it happen! ), she’s the artist of our circle tattoo dreams. A great nod to childhood curiosity. For art lovers all over. We just love this one. Makes us want to explore! Seriously, does it get any more impressive than this? This is so, *so* cute. Because a little bit of scary on your body can be SUCH a good thing. We should really spend more time outside, but until then, this is a constant taste of sunlight. The moon is beautiful, but this tattoo may be even more beautiful. We can almost smell the fresh air. Ugh, we need this so much it hurts. This would be *so* calming.